A tropical oasis, this self-catering apartments in The Gambia is set in tropical gardens with a magnificent swimming pool for guests to relax. The spacious living area includes an open plan kitchen/dining area with well equipped kitchen, gas cooker, oven and fridge. The lounge is comfortably furnished with satellite T.V. The bedroom is spacious, light and airy and the bathroom is fully tiled with a walk-in shower, washbasin and toilet. There are ceiling fans in every room. There is 24 hour security . The apartment has its own private rear terrace and garden. The front balcony area overlooks the tropical gardens and swimming pool. The patio doors fully open facing the swimming pool. The swimming pool is set amongst the tropical gardens. Birds of paradise, banana plants,colourful exotic flowers surround you as you swim. Relax under the shaded banta bar or on the sunbeds on the terraced patio that surrounds the swimming pool. Bbq al fresco under the velvet starry skies of Africa. The Gambia is a paradise for birdwatchers and fishermen.There are more species of birds found here than in any othe country in Africa. Hire a boat and go deep sea fishing.or fish from the beaches and eat your catch for tea. The bathroom is fully tiled, with a walk in shower and toilet. Safety deposit boxes are available at 10GBP per week. Wi-fi internet access is also available at 10 GBP per week and lap top computers may be hired on site facilities may vary slightly from apartment to apartment. Our first experience, at the airport, was getting in the wrong taxi. There was apparently a mix-up, we didn't find our driver, we found another driver waiting for someone with a similar name. This was a costly experience. The situation was not helped by the HomeAway email having an incorrect telephone number on it. Rosemary was very helpful when we did arrive, rather late. There was no wifi, though this was apparently beyond Rosemary's control. There was a range of plates, pans etc though some were not quite clean on arrival, they were however clean when we left. We did enjoy our stay, the question of return does not arise as we never go back to the same place twice, there are too many new places to see. We are glad you had a pleasant stay after a bad start jumping in the wrong taxi. The WiFi was in the process of being upgraded to 4g. This means that all customers have a very fast and efficient WiFi 24 hours a day. I am always amazed that when customers are not happy with something that they do not say at the time so it can be dealt with quickly. The hosts were all you would expect and more. Helpfull, frieandly, but not intrusive. Not a 5* property, but it does not pretend to be. Very good value for the money paid. Suitable living and sleeping accommodation, ceiling fans, nice pool (kept clean), clean compound and secure. WIFI being replaced while there, so a nuisance, along with the electricity cuts, but the later was universal and there was solar lighting. Cooking and preparation utensils basic. Would certainly stay there again, it was not a disappointment, it was a pleasure. We will you again shortly Rosemary. A great peaceful relaxing environment. The only noise I heard was birdsong! I had a fabulous time here and would definitely return. Lovely staff lovely location cool spacious well equipped comfortable apartment. In a safe and secure compound. A wonderful vibe and energy! I didn't want to leave. A big thank you to all who made my stay so wonderful! Nobody met us on arrival and it was the taxi driver that actually showed us to our accommodation. Mustafa was polite unlike the frosty demeanour of his wife. I would not return. The beach was 35 minutes walk and not 10. The closest place to eat was 20 minutes walk. The closest atm was a 30 minute walk. Being woke at 6am each morning due to morning prayers through a loudspeaker across the road took its toll on us after 2 weeks of listening to it, it woke us with a start each day and was so loud i thought it was in my room, impossible to sleep through this, though the owners were trying to address this. We had to buy cleaning products to clean the kitchen area before we could use it. A complimentary bottle would have been nice on arrival. I really am extremely surprised by this review. If we are not there to greet guests on arrival one of the staff will welcome them .I spoke to the staff who said they were welcomed in properly and they couldn't understand this. These staff have worked here for 5 years and are both very cspabel. How could the taxi driver have known where to take them etc???? Despite being told the 10 min way to the beach they did seem unable to follow the instructions so advised them to get a local taxi to take them.The same applied to the local restaurants which are about 5 to 7 mins walk away with the nearest ATM machine also only 15 mins walk.Again we advised them to take local taxis if they walked slowly and the walk too much for them. The problem with the mosque was resolved very quickly.We did apologize and told them that it was being addressed and would be resolved as soon as the local chief had spoken to them.It was solved very quickly and the loudspeaker has been removed altogether.There is no problem st all now. These guests ate in some of the local restaurants and constantly complained about the food and the service I myself and many of the guests have never had complaints with these restaurants so again I could not understand this. There seemed to be difficulties wherever they went whether the beach or the restaurants.They found it very hard to deal with the local people who are always very friendly . We are sorry they did not enjoy their stay in Africa and cannot understand why they did not raise any of these complaints to us during their stay. We always do our best to put right any genuine complaints and most guests are very happy with their stay here as is shown in our reviews. We do have an 85% return rate at Bsnsns Lodge. We always make our guests very welcome. Our cleaners are first class and again have worked here for many years.Why did they not talk to us st the time? I wish these guests wekk in the future but maybe Africa is not the correct choice for their holiday destination. Had a great time fantastic value for money. The pool and gardens are great, just what you need to cool down on those hot days. I thoroughly enjoyed my stay and will return in the very near future. I would like to start by saying that i have stayed here 3 times now and to me this place feels like home. Rose and Mustafa are so accomodating that i couldnt ask for more. There are many great things about this place.... The gorgeous deep pool, the staff, private garden area at back of the apartments, kitchen facilites and fridge (i especially like this part because it enables me to get african ingredients from local markets not far away and experiment cooking, something i cant do at many other places) Its bright clean and airy and i guarantee this is perfect for any length stay in gambia. Here you can have the choice to be quiet and private or to join in with other members staying there. Rose and Mustafa went out of their way to make all of my stays there really enjoyable. My Partner and i will always go back to the same place. 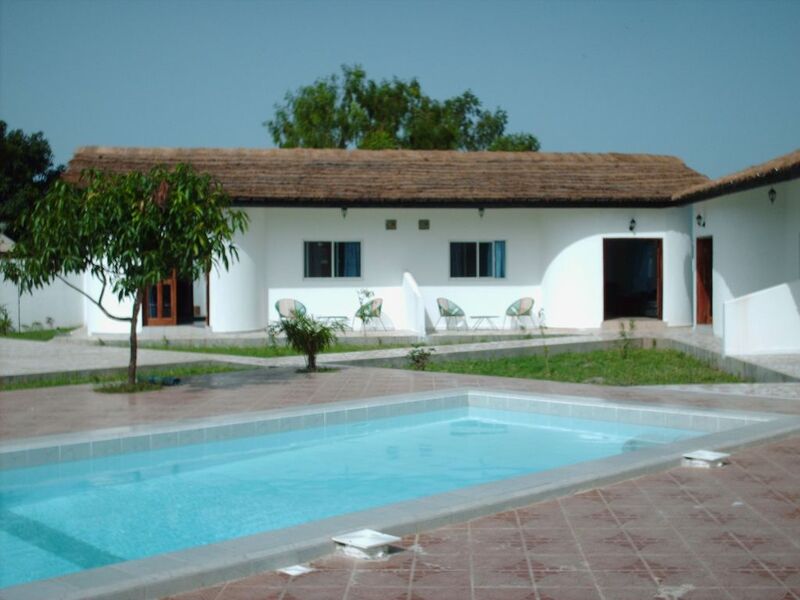 Located on the outskirts of a traditional African village, Brufut, one minute from the main coastal highway, with wonderful unspoilt beaches close by, this private apartment with pool offers the perfect setting for exploring the Gambia. The capital city of Banjul, the crocodile pool of Bakau, Senengambia ,the fishing villages of Tanji and Brufut, the lazy villages of Kartong, where time goes back 100 years are all within easy reach.Go and explore and then relax in a hammock by the pool as the sun goes down. The beautiful beaches are out of this world and within easy walking distance of the apartment..We welcome gap year students and are very happy to arrange voluntary work placements dor all ages iworking in local schools, hotels,and other charitable organizations especially during the green summer period.We jave had many successful placements. Wi-fi is available at £10 per week. Xmas weeks from 22nd December to January 2nd 25 pounds extra charge per week. Safety deposit boxes are available at a small extra charge. Maid service and local cooking at a small extra charge.